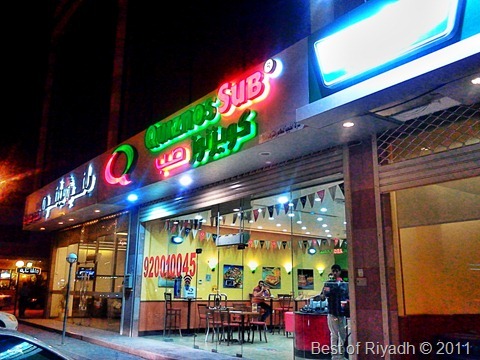 I would like to share the below pictures taken @ Quiznos Sub Along Khurais Service Road near Dhabab St. Quiznoz will prepare the sandwich the way you like it, after choosing on what meat do you want as part of your Sub Sandwich, they will insert the bread in the grill. This is actually a grilled bread. 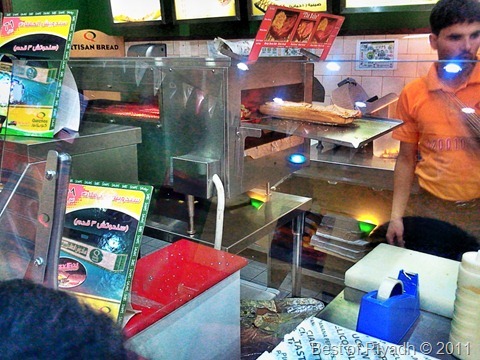 I like their Turkey Ham with cheese and salad.The customer could also get some appetizer at the side like Jalopeno. Crew are friendly and could definitely speak English. It will cost about 15 Riyals for the small one with the Soft drinks or juice. Sad to say No Family Section, they would only allow woman to enter provided they are with with their husband. Woman canâ€™t eat inside.